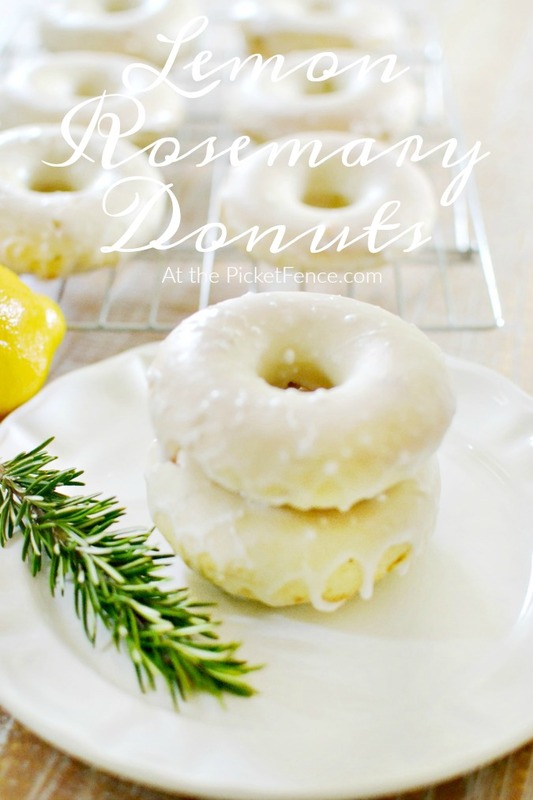 I feel the need to make something crystal clear here before I share the recipe for these scrumptious lemon rosemary donuts. We’re all about transparency here At the Picket Fence. Baked donuts don’t taste the same as friend donuts. Shocking, right? Well, you may not be totally surprised by this news but my children definitely were. Our foray into homemade donuts has been an eye-opening education for them in the difference between fried and baked. But, that being said, they are still so very, very yummy. In fact, what they lack in fried-ness (totally a word, right? ), they more than make up for in dough-y, cake-y goodness. 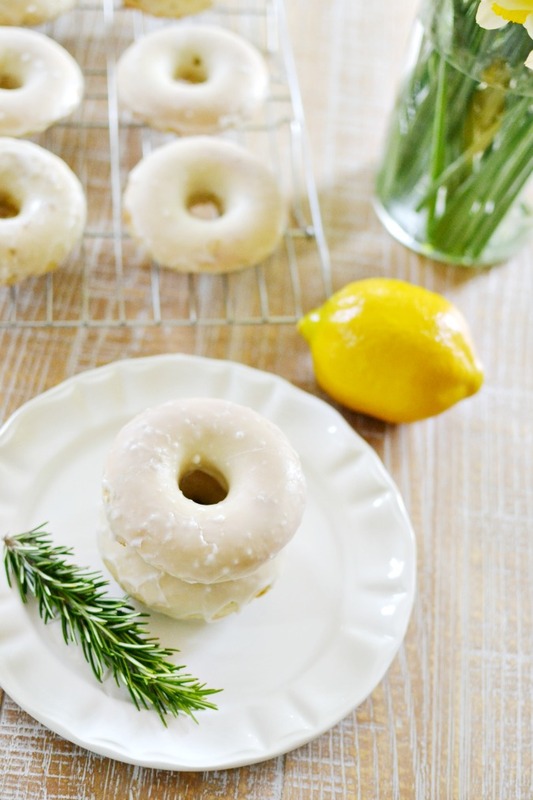 And when you decide to celebrate spring by making them lemon flavored with a hint of rosemary, they go to a whole new level. In case you didn’t know, I’m slightly obsessed with lemons. 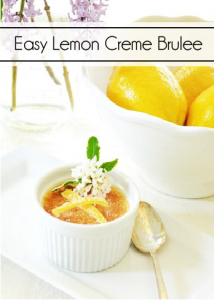 I’ve used them to make Lemon Pasta and Lemon Crème Brulée and I pretty much love anything citrus flavored. And lemon and rosemary go together so perfectly. Like, peas and carrots. And when you bite into it and can actually see the rosemary, it’s like all of your senses are heightened. 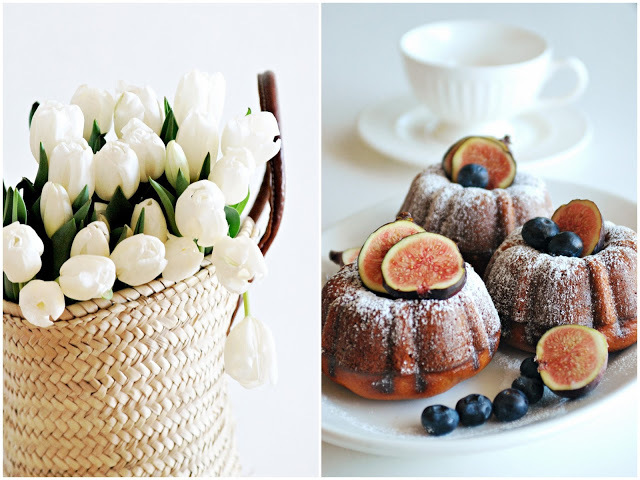 Frankly, it’s kind of like capturing spring in a donut. Because, I don’t know about you, but right now I feel like the whole world is coming to life and all of my senses are in overdrive. The aroma of the flowers popping up around my yard, the visual beauty of seeing buds opening on the branches of the trees, the moments when the sun breaks through the clouds and my skin absorbs it’s warmth, and even the sound of the rain pattering on the windows is a reminder of the season. Spring has definitely arrived here in Oregon. 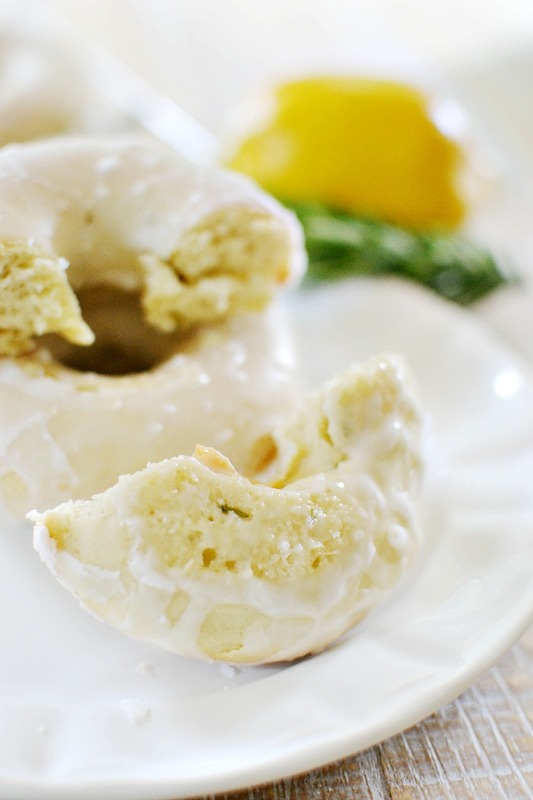 And it’s like a spring party in my mouth with every bite of these lemon rosemary donuts. Oh, and they have a lemon flavored glaze on top of them. Because…well…you know…lemons for the win! 2. 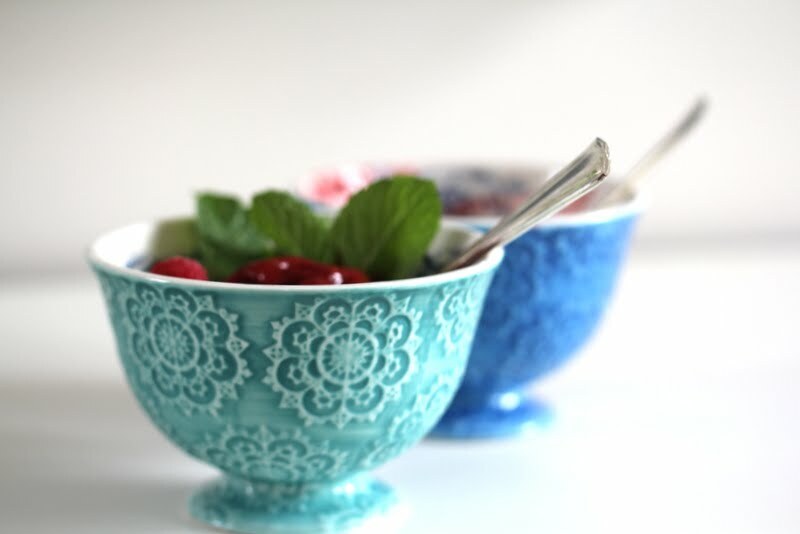 In a mixing bowl, beat together the butter, vegetable oil and sugars until smooth. 3. Whisk the eggs and then add to the mixture in the bowl. Mix well. 4. Stir in the baking powder, baking soda, lemon extract/juice and salt. 5. Stir in the flour in the mixture alternately with the milk. Mix well. 6. Stir in the rosemary and mix until just combined. 7. Pour batter into large ziplock bag and cut the tip off of one corner. 8. Pipe the batter into a donut mold filling only 1/2 of each donut shape. 9. Bake the donuts for 10 minutes or until toothpick inserted comes out clean. 1. Measure out powdered sugar and pour into mixing bowl. 2. Slowly add in the milk, stirring to combine as you go. 3. Add in the lemon extract and juice and stir to combine until all of the sugar is dissolved. 4. Let donuts completely cool before dipping the tops in the icing. 5. Allow icing to harden before serving. Lately I’ve been having a lot of what I refer to as ‘Twilight Zone’ moments. 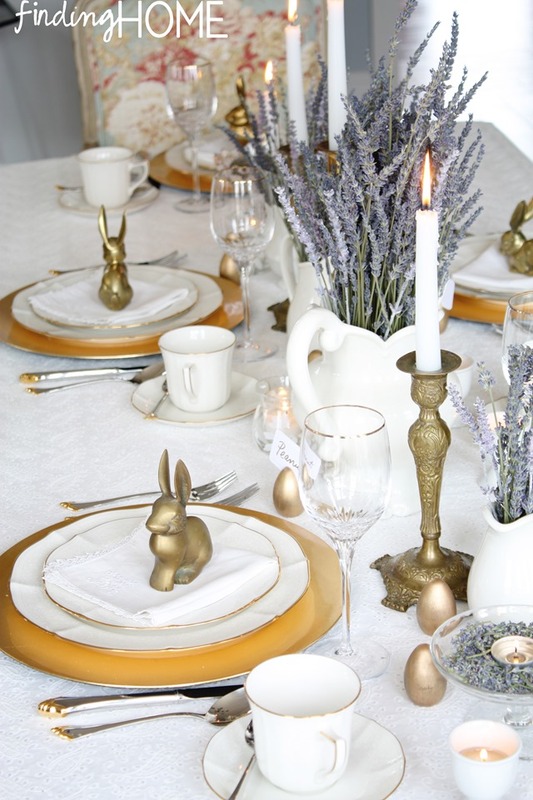 I’m pretty sure it was just Christmas and yet here I am today sharing Easter Recipes and Table Decorating Ideas with you. How did that happen? 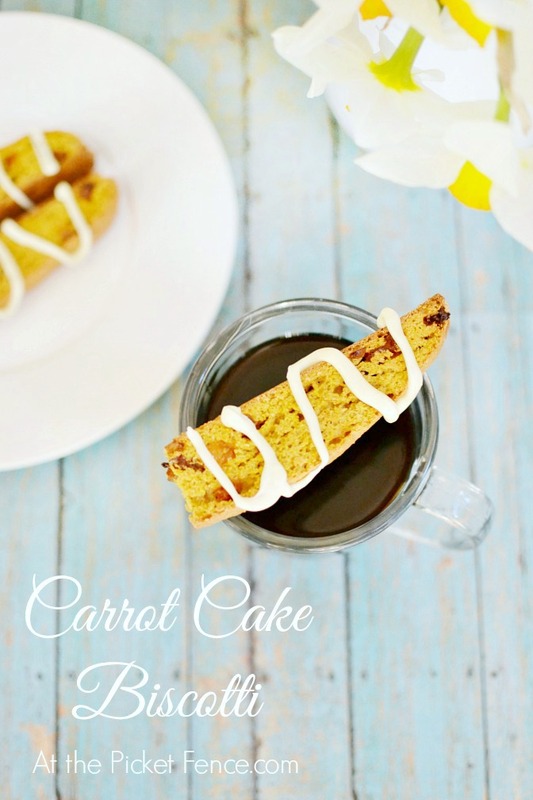 Carrot Cake Biscotti & Giveaway! I love baking. Honestly I WAY prefer it to cooking. This might have something to do with the fact that anything I bake is received by my family with joy and gratitude as opposed to the meals I cook each night which, frankly, are always a bit like a shot in the dark. Sometimes they hit their target and sometimes they are so far off from the target you would think that I was purposely trying to torture them. 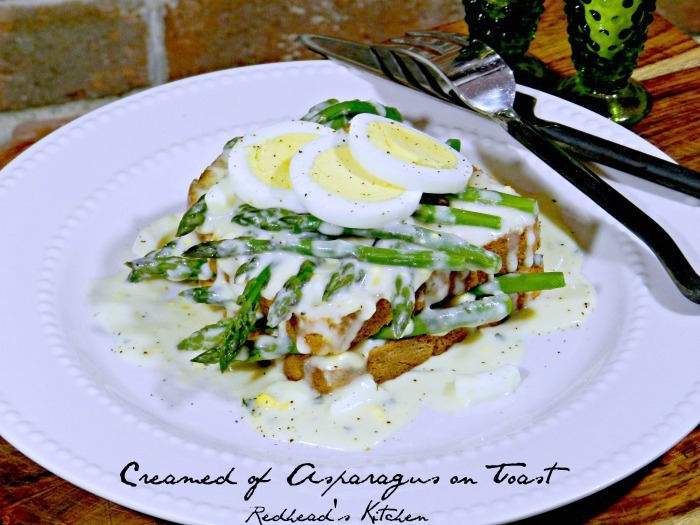 Okay, there really isn’t a Gus, or anything to spare, but I’m trying to get your attention because I’m talking about asparagus today. Yep, good ole “green sprig most people run from” asparagus. Oh my goodness, doesn’t that look scrumptious. 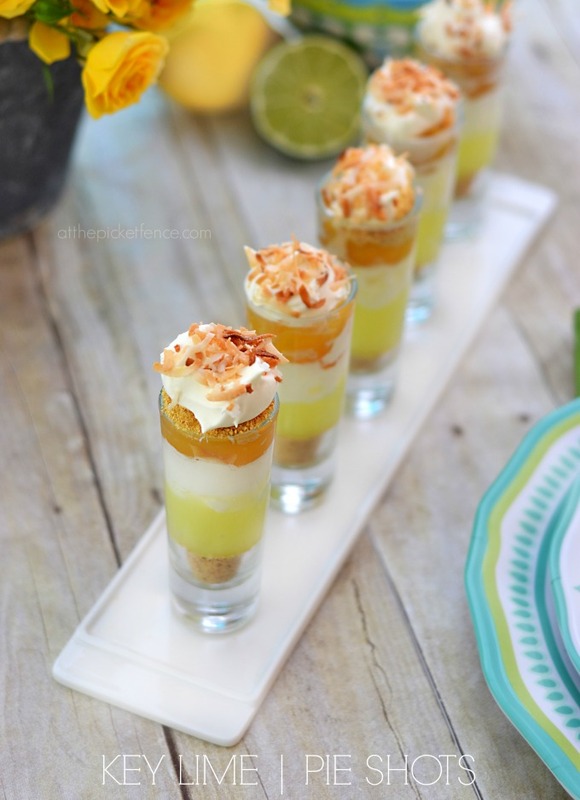 Key Lime Pie Dessert Shots and a Party! My daughter has always had a fascination with miniature things. Teeny-tiny notebooks and tape dispensers. Little tiny plants and wee little animals to place in her shadow box. I must admit there’s a certain fascination I have, as well, with cute little bitty things. Like cute teeny appetizers, mini-cupcakes and now the popular tapas, which are small savory dishes. 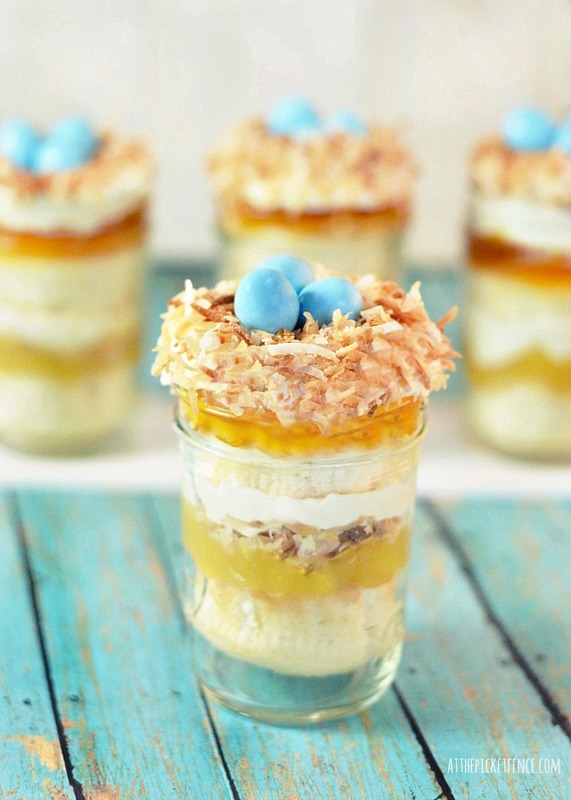 So it’s no wonder I’ve fallen in love with serving small individual desserts with big taste. Turning Pineapple Upside Down Cake..upside down! Okay so maybe not actually upside down, but I definitely turned the classic pineapple upside down cake on it’s proverbial head. 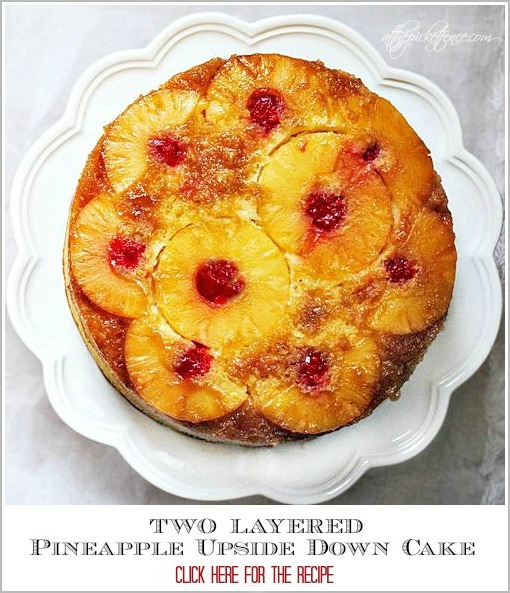 I was researching 1920′s desserts and came across several recipes for pineapple upside down cake; but being someone who always likes to liven things up and try something new I, of course, had to give a twist to the idea! This my dear readers is a two layered round pineapple upside down cake. …er uh okay forgot I wasn’t ACTUALLY in 1920. 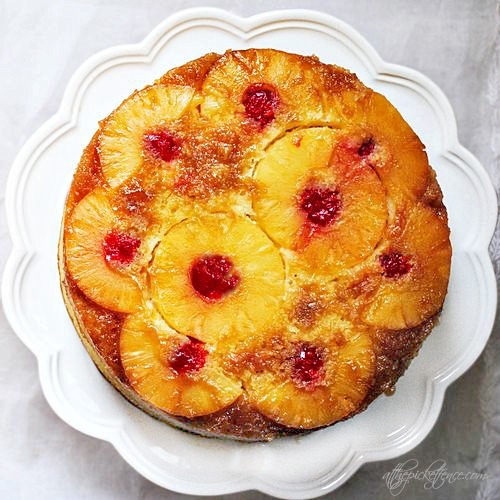 Many people don’t know that the Pineapple Upside Down Cake first hit the scene in the 20′s with the invention of…you guessed it canned pineapple! All those housewives in the Midwest who’d probably never even seen a pineapple let alone eaten one, were all of a sudden expected to come up with something to make with it. So what else are you going to do if you’re a 1920′s Midwest housewife… bake a cake of course! 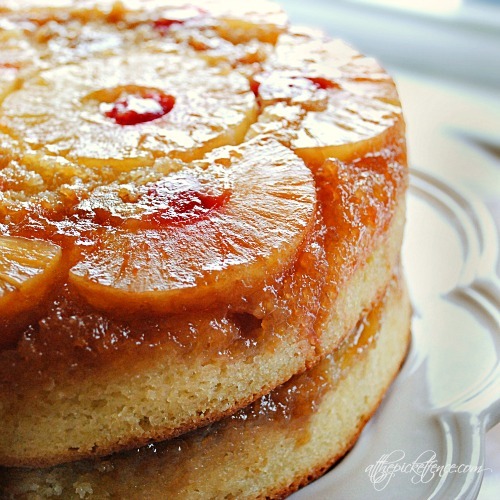 The Pineapple Upside Down Cake was a huge hit and it’s been with us in some variation ever since. So here’s my take on it. Hope you like it! I'm turning the classic Pineapple Upside Down Cake on its head with this two layered round version. 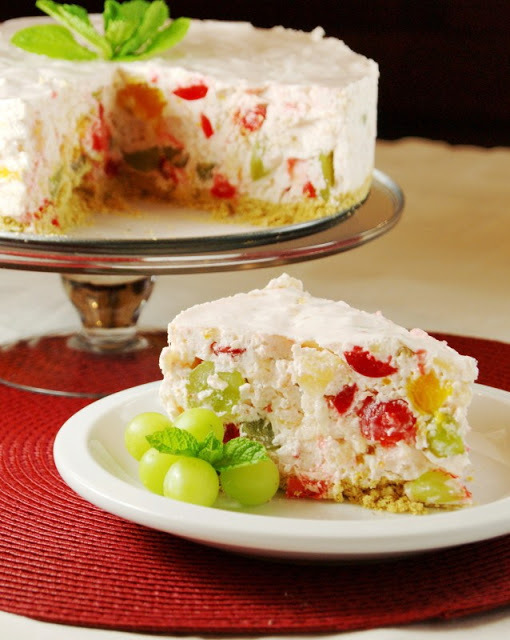 For more great treats be sure to visit our Desserts Page! We are gearing up for Easter Sunday at our homes and am sure many of your are doing the same! We’ll be sharing some special thoughts this weekend on the significance of Good Friday and Easter…so see you back here soon at the picket fence! 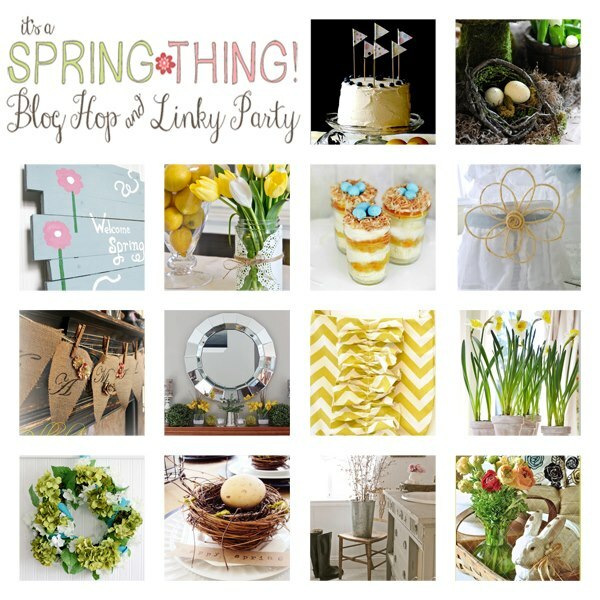 It’s A Spring Thing Party Features! How about 717 FABULOUS Spring Project Ideas!!! 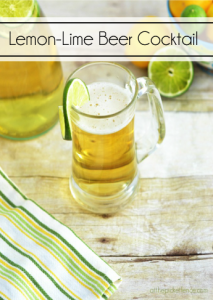 We have loved seeing all of the amazing recipes, crafts, tutorials and home decor linked up to the It’s A Spring Thing Linky Party! 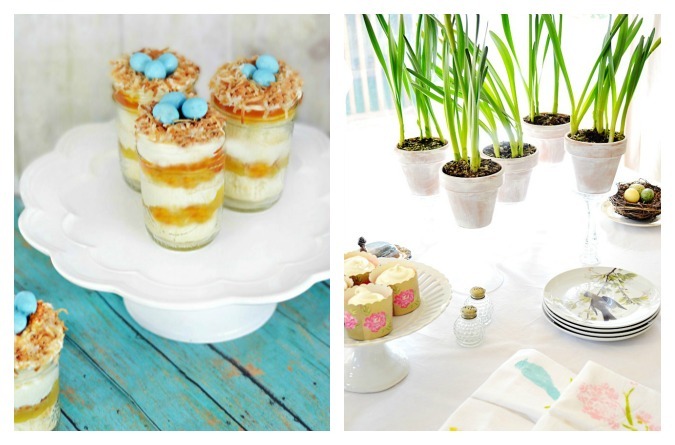 We’ve gathered up a few of our favorites based off of the projects we shared during the It’s A Spring Thing Blog Hop! 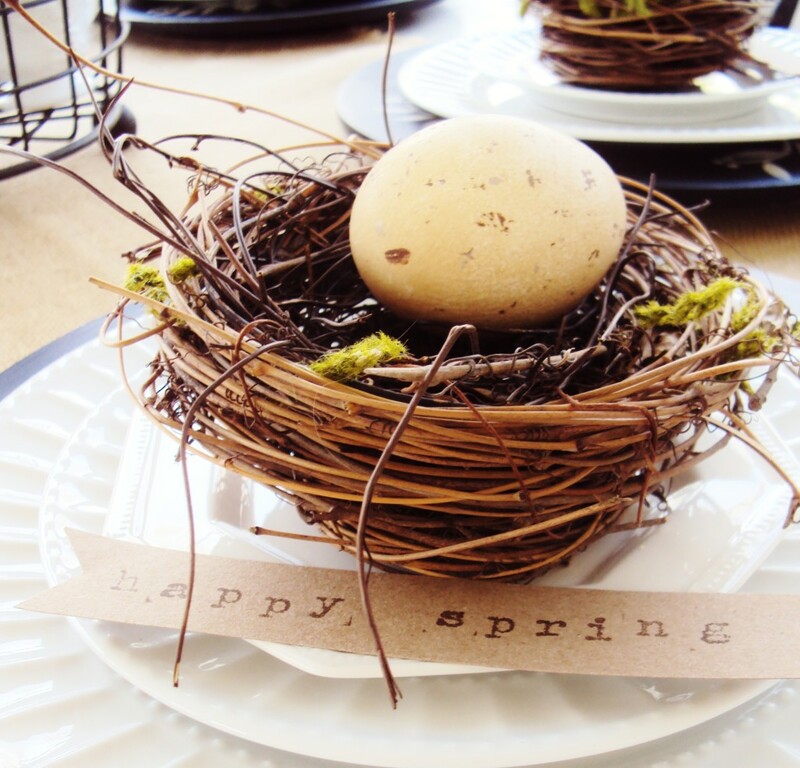 As a recap Heather showed how to create Bird’s Nest Cupcakes in Mason Jars and Vanessa showed how to decorate a Spring Tablescape and Mantel. 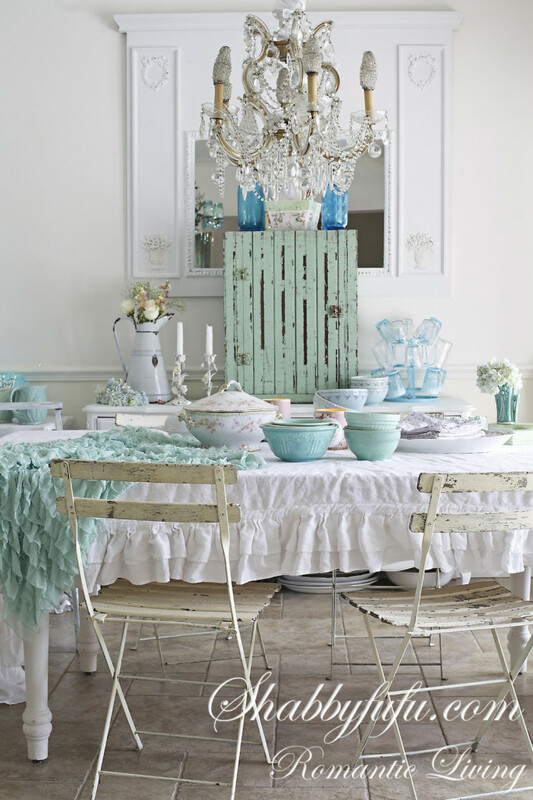 And here are some of your standout Recipes, Tablescapes and Mantels! Inspired by Flowers from Sylvia’s Simple Life. This post is full of gorgeous photography! Thank you so much to everyone who linked up their amazing spring posts! 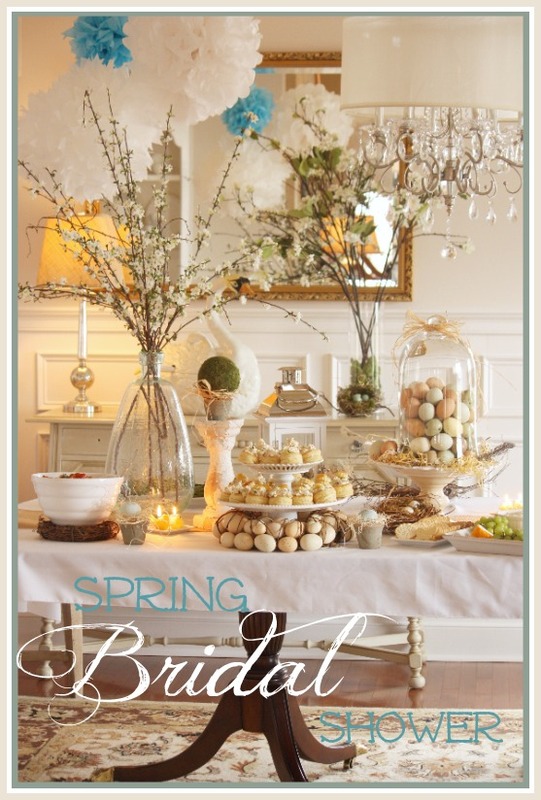 Hope you enjoyed this fabulous round up of Spring Features..and our It’s a Spring Thing Hop and Party! PLEASE PIN THESE LOVELY FEATURES FROM THEIR ORIGINAL SOURCES! 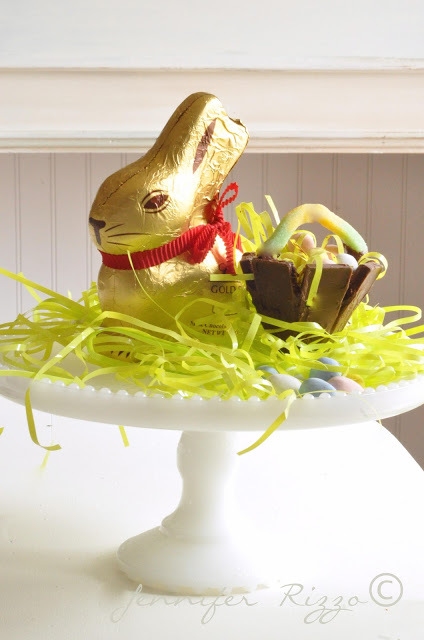 Tomorrow we’re sharing another great last minute Easter Project from our amazing contributor Julie. 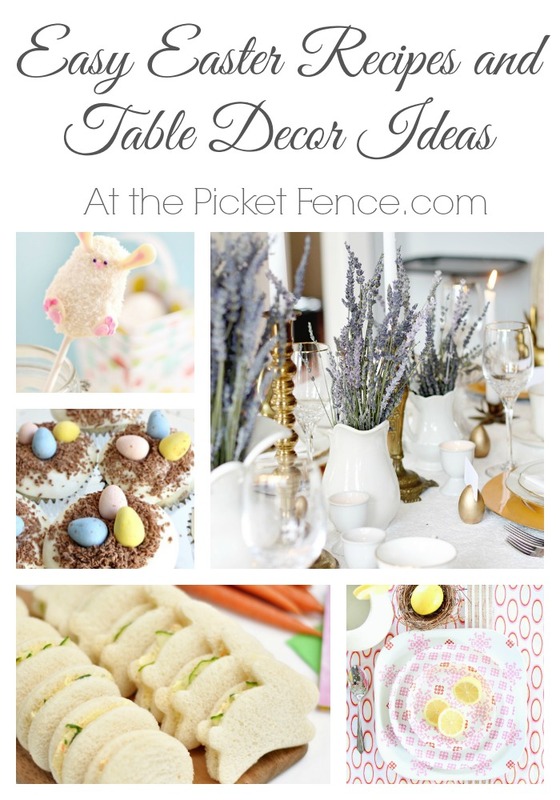 See you then…at the picket fence! 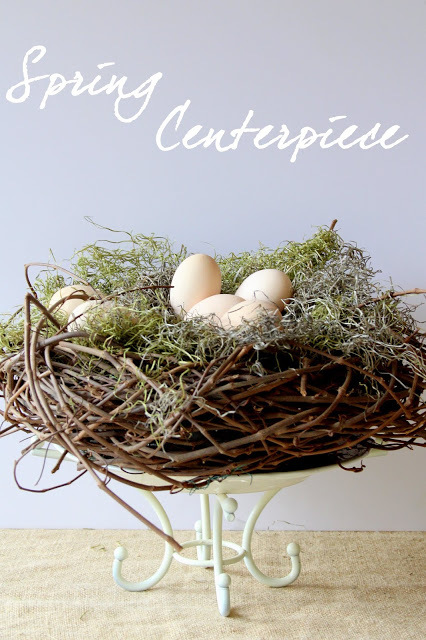 Fourteen Fabulous Spring Projects and a Linky Party! What happens when fourteen fabulously talented bloggers collaborate together? 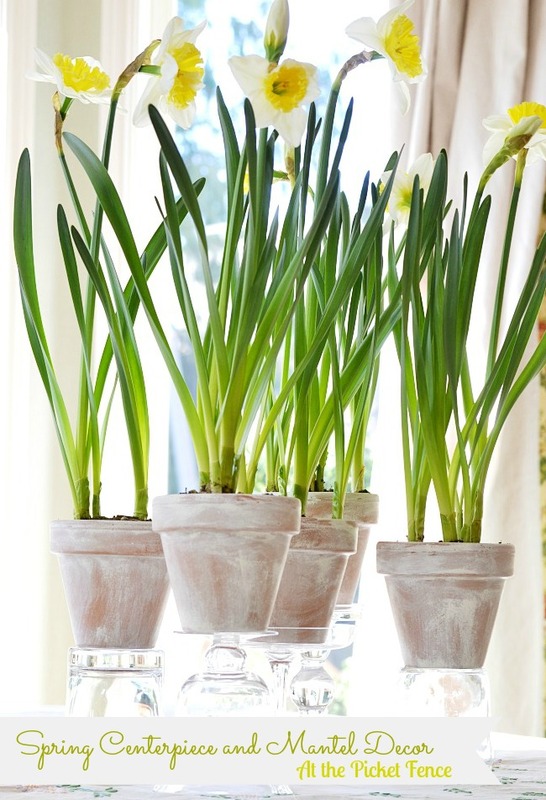 They come up with some of the most amazing spring projects you’ll see this season! 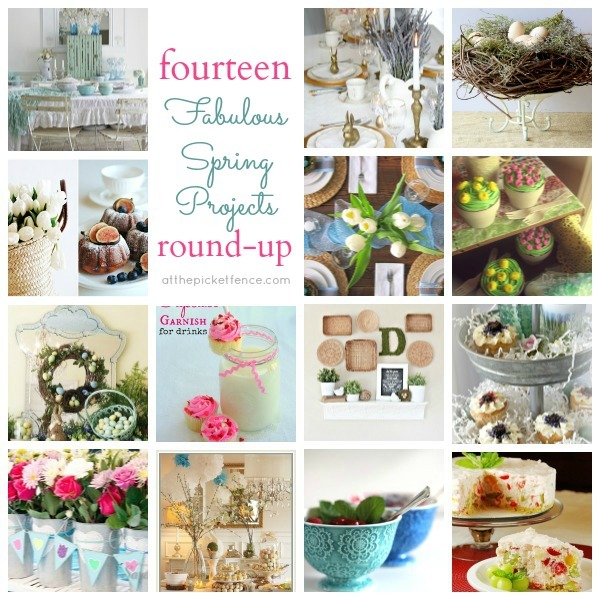 It’s definitely been “a spring thing” around here for the last two weeks and we’re excited to wrap this blog hop up with a round-up of all fourteen amazing spring ideas, in case you missed any the first time, and an AMAZING linky party across 13, yes that is THIRTEEN, blogs! If you link it up we promise EVERYONE will see it!! 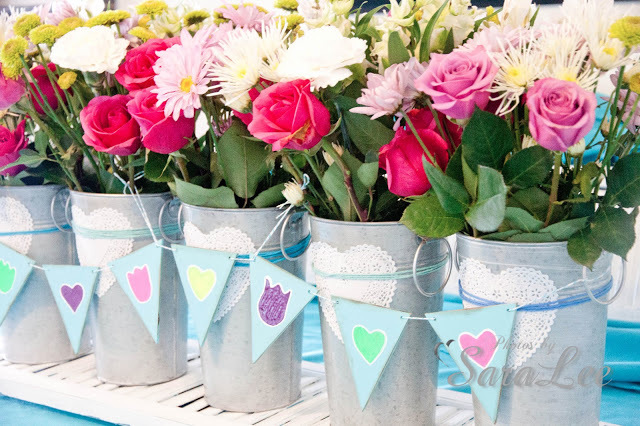 Here At The Picket Fence you often get “two for the price of one”, we enjoyed getting to show off two spring ideas during the party! Vanessa showed us how daffodils can brighten both a table and a mantel, and shared the beauty of being the daughter of a farmer’s daughter. Here’s a recap of the other amazing ideas, recipes, crafts and home decor from these talented gals! 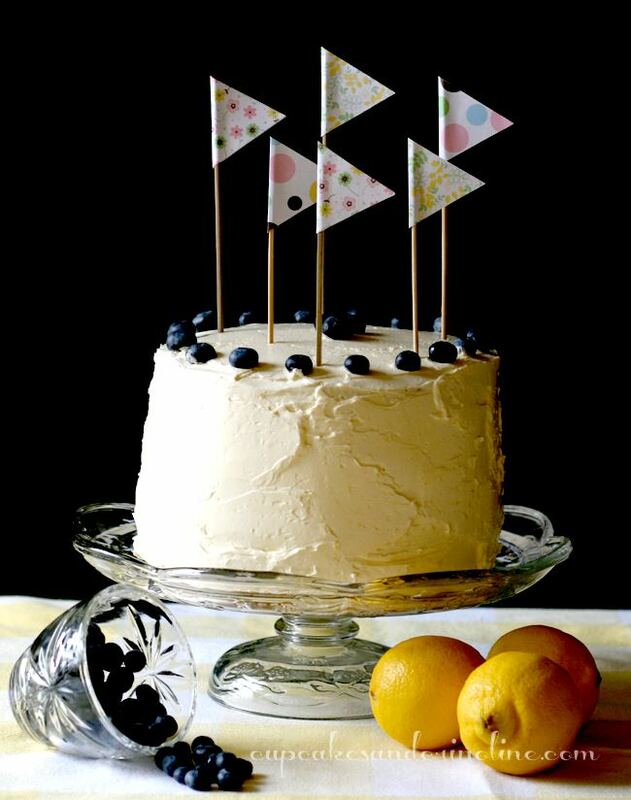 Mary Beth, of Cupcakes and Crinolines kicked off our blog hop with this GORGEOUS Lemon and Blueberry Butter Cake! 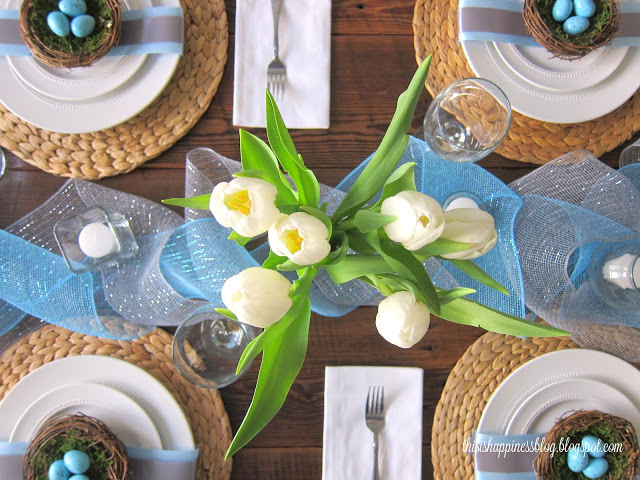 Jennifer, of Dear Lillie, set us a place at her beautiful Spring Tablescape in her decked out for spring dining room! 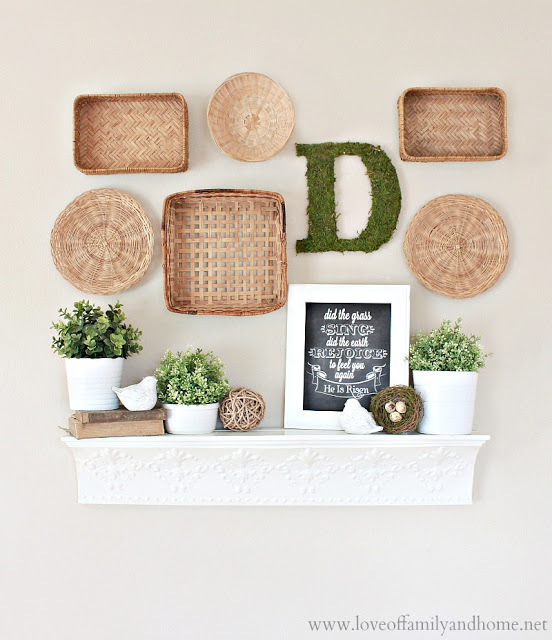 Kristin, of My Uncommon Slice of Suburbia, shared with us how to make this darling Scrap wood Spring Sign. 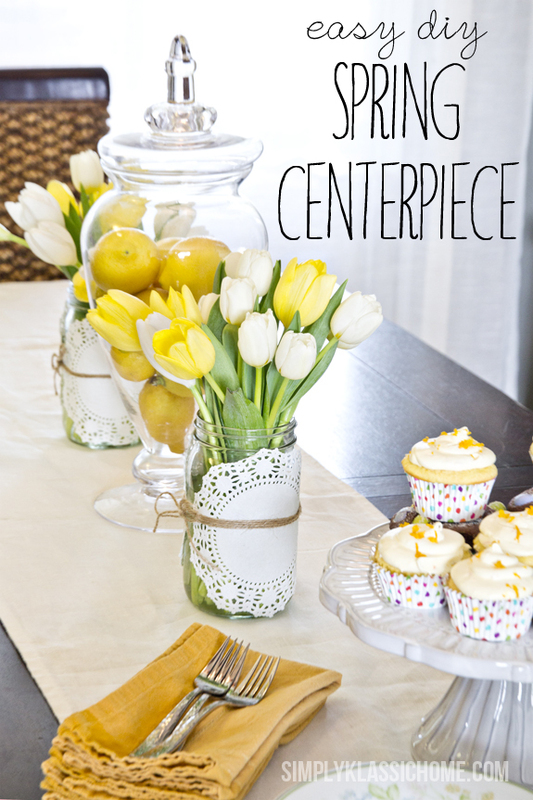 Our other Kristin, of Simply Klassic Home, gave us a lesson in creating an Easy and Frugal Spring Centerpiece! Shannon from Fox Hollow Cottage shared her beautiful Spring Mantel complete with a re-purposed pillow sham! 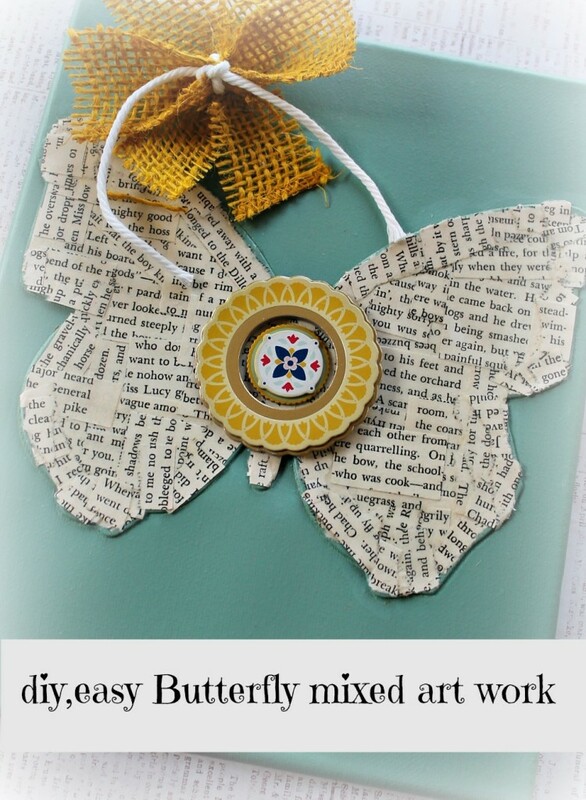 Debbie from Debbiedoos shared a round-up of 10 Fabulous Spring/Summer Crafts. 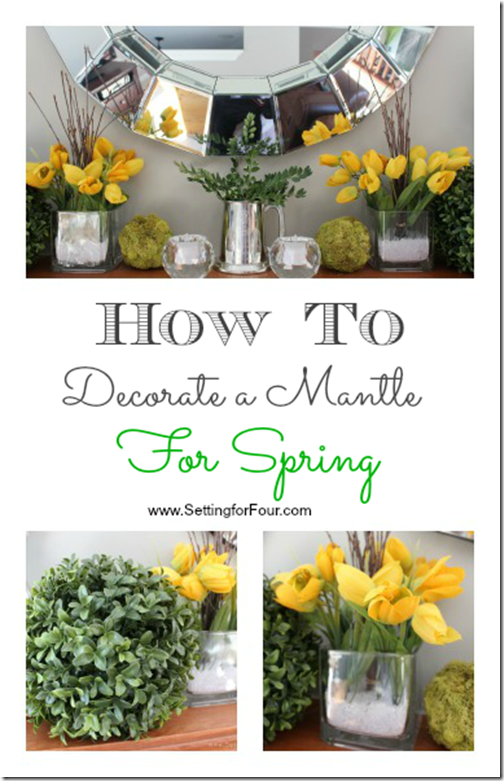 Heather from Setting for Four showed us How to Decorate a Mantel for Spring. 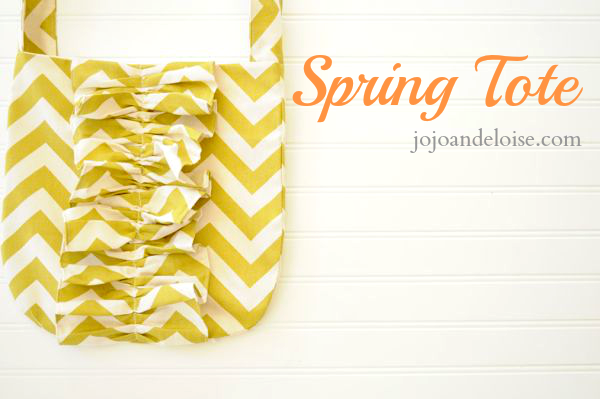 Angelina from JoJo & Eloise gave us a fabulous tutorial for making a darling Spring Chevron Tote Bag. 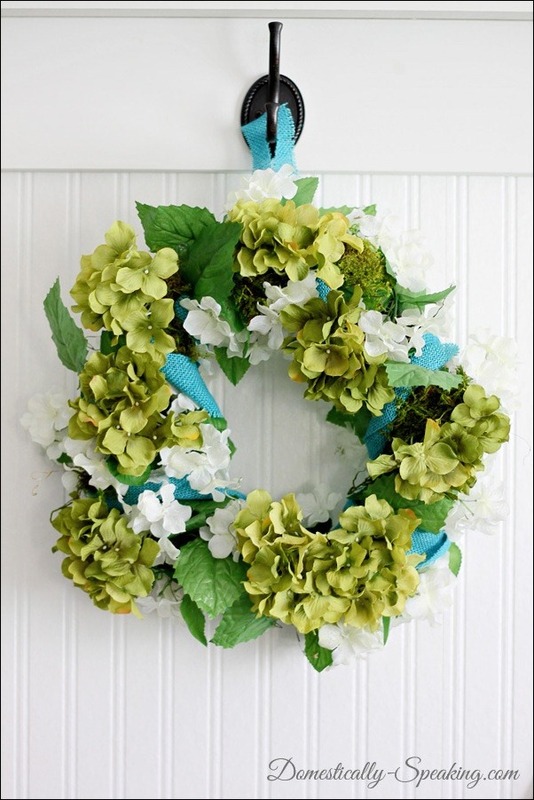 Maryann from Domestically Speaking showed us how to make this lovely Blue and Green Spring Wreath. 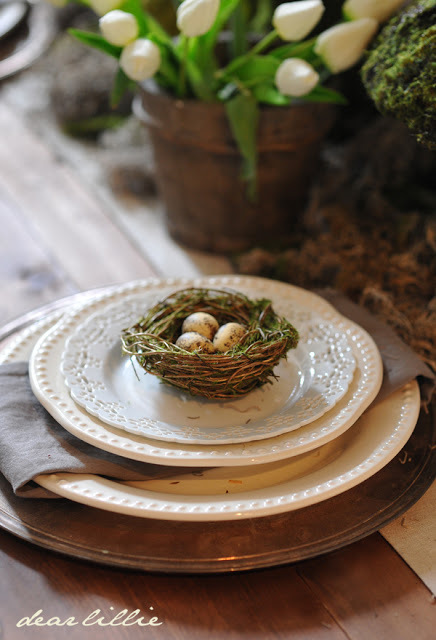 KariAnne of Thistlewood Farms shared her simply adorable Tea Stained Eggs. 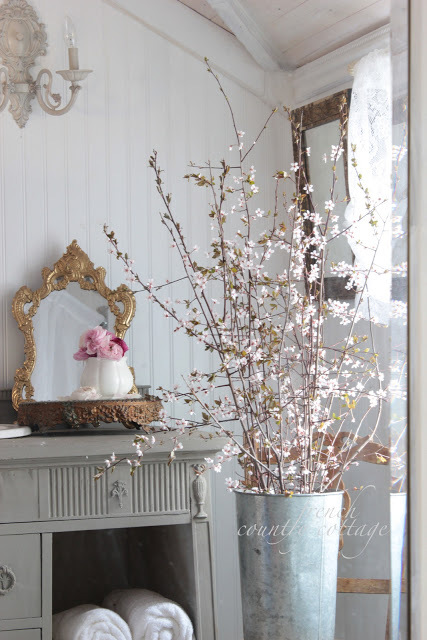 Courtney from French Country Cottage shared the beautiful simplicity of Spring Blossoms. 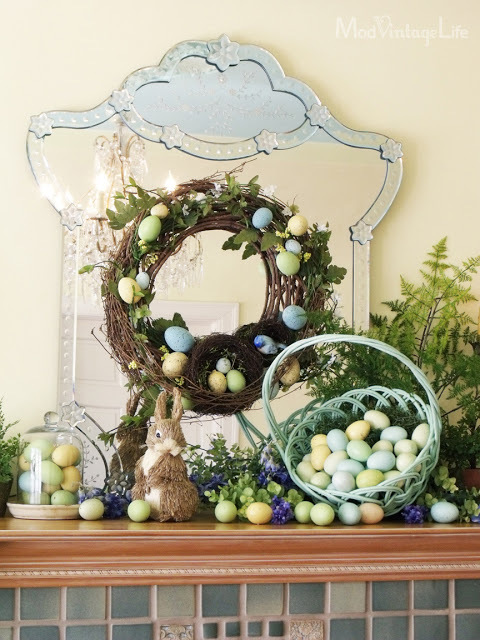 Jennifer Rizzo of the Jennifer Rizzo Blog wrapped up the fun and showed off her lovely Spring Decor and a Sweet Kids Project. 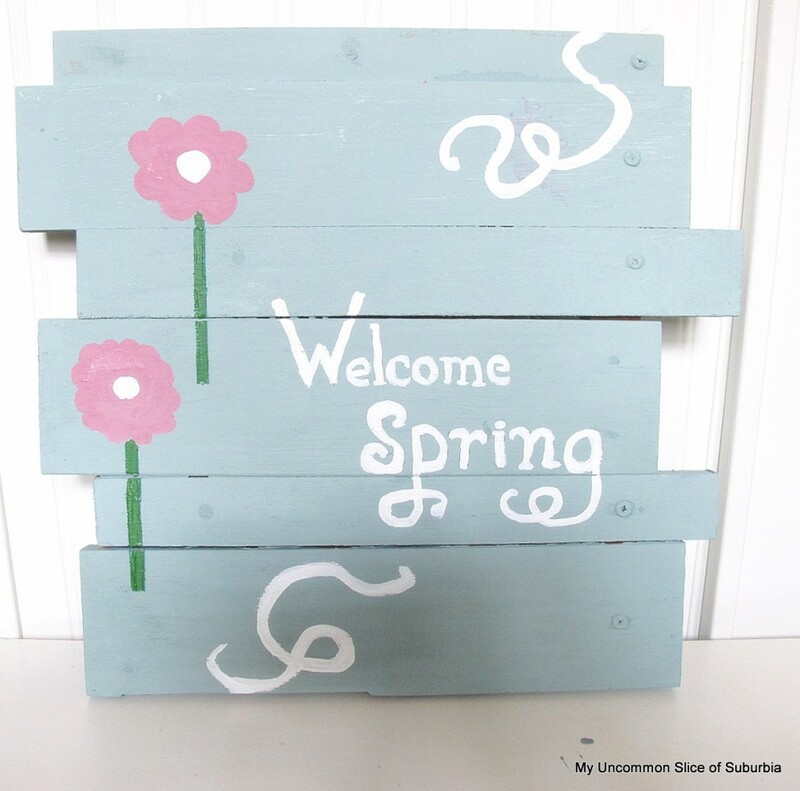 Link up your own fabulous Spring Projects here and have them show up on all 13 Blogs!! That’s right! We know you have been busy welcoming Spring too and we can’t wait to see all of the talent and inspiration collected in one place. 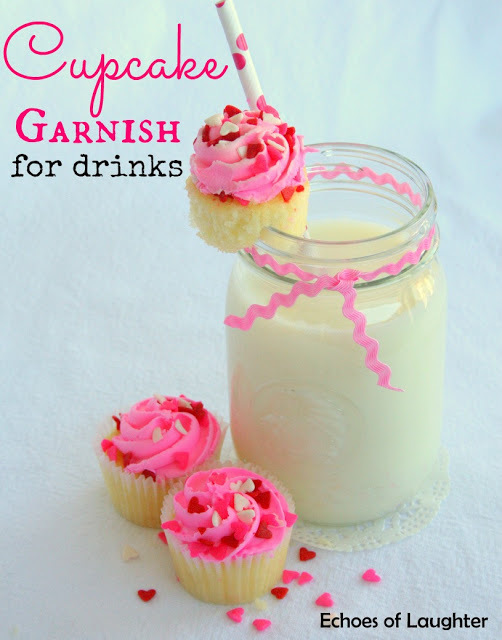 You can also share your project on the It’s A Spring Thing Blog Hop and Linky Party page on Google+. So, what are you waiting for? Link on up! 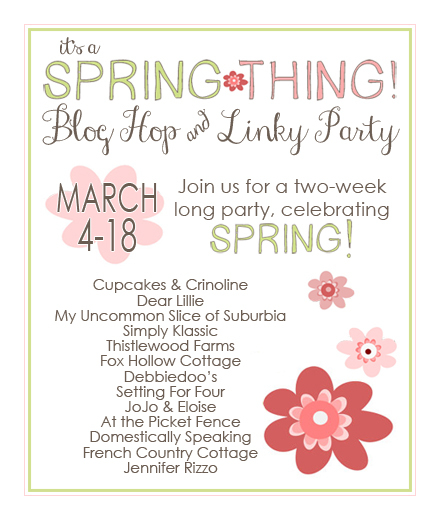 And thanks so much for joining all of us for the Spring Thing Blog Hop and Linky Party! There’s nothing more scary for a car owner. You’re traveling down the road and you hear an ambiguous noise. You know the one. The noise that happens intermittently as your driving blissfully along, the one that strikes fear in your heart and then you don’t hear it for days. And just as your lulled into a sense of complacency, it happens again. She did, so you know you’re not losing your mind. At least in this case. You ask her to climb around in the back of the car in the parking lot, just to make sure there isn’t some strange animal in the car…you do live in the country after all. Nothing. Days later you hop in your freezing cold car and while warming up and sitting at the light, there it is again! After a week of “pinging” and “pinking” you drive cautiously waiting for your axle to fall off or a stray squirrel to make it’s way out from under the back seat. 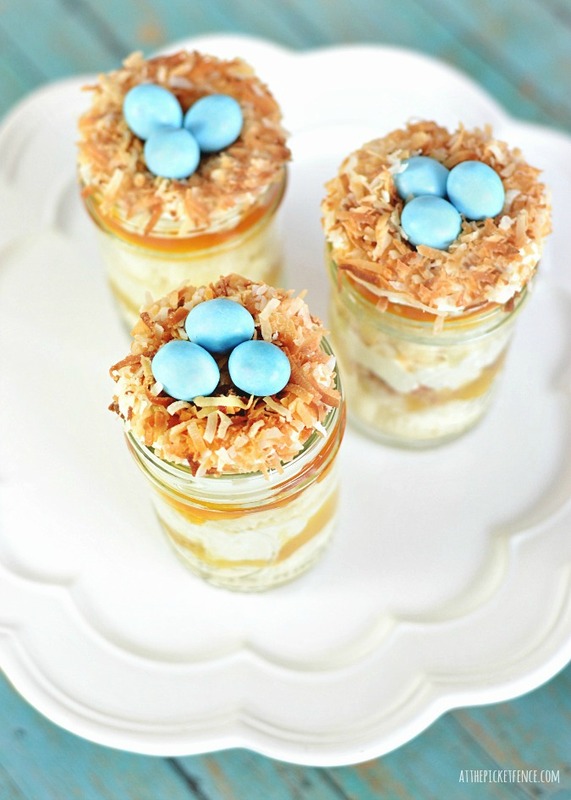 Then a snowstorm comes and you decide, on this snowy day, it’s a good time to make those Bird’s Nest Cupcakes in Mason Jars you’ve been envisioning. So you ask your daughter to grab that flat of mason jars you’ve had in the back of the car for a week. The distinctive “ping. pink. ping” of a dozen mason jars lids sealing….the sound of you saving $1,000 in car repairs and a whole lot of embarrassment. 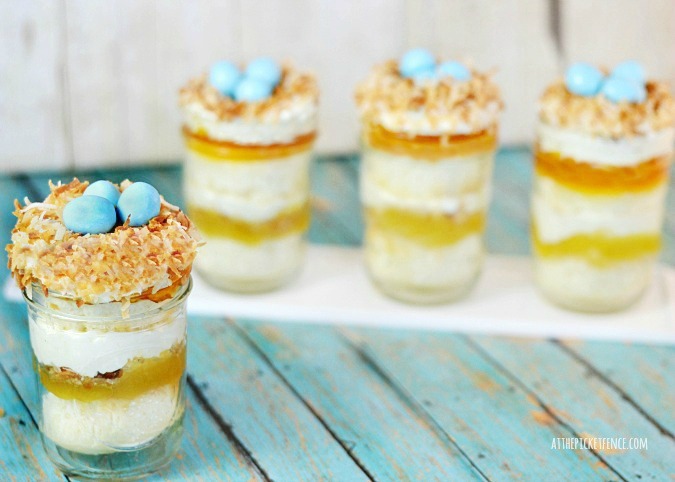 Here’s how to make your own Bird’s Nest Cupcakes in Mason Jars layered with white cake, lemon curd, apricot-pineapple preserves and cream cheese frosting. 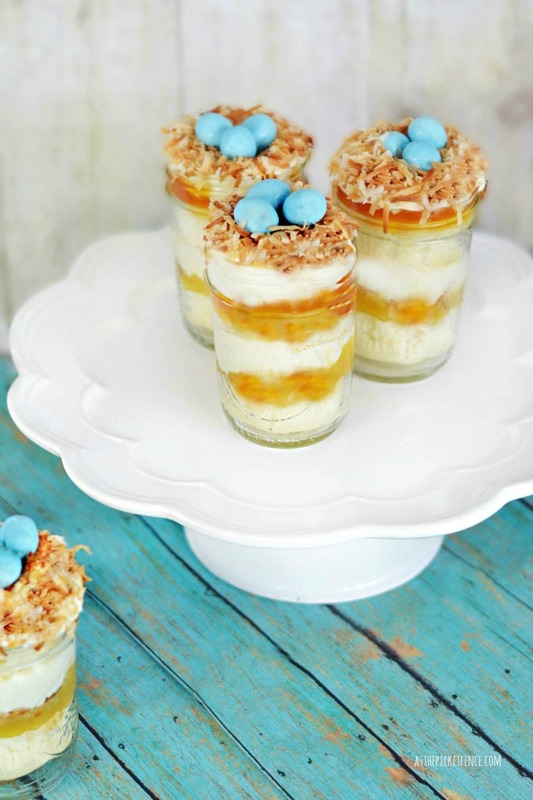 Topped with toasted coconut…it’s a true spring treat! Bird's Nest Cupcakes in Mason Jars! A perfect way to celebrate spring! 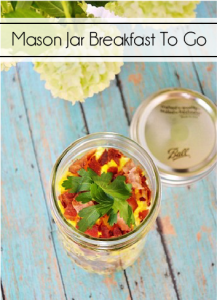 Repeat for each jar. Will make approximately 8 servings. 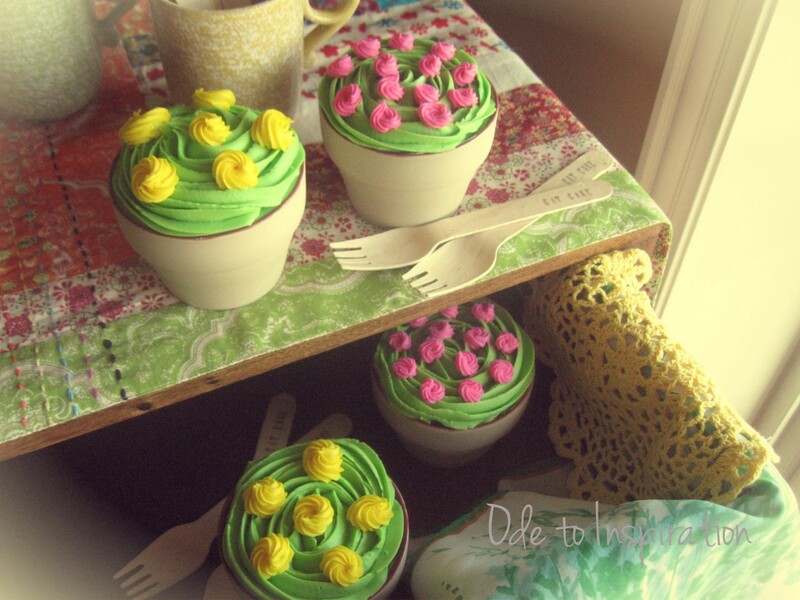 This post is part of the fabulous “It’s A Spring Thing” Blog Hop and Party! Have you seen the other amazing projects this week?! 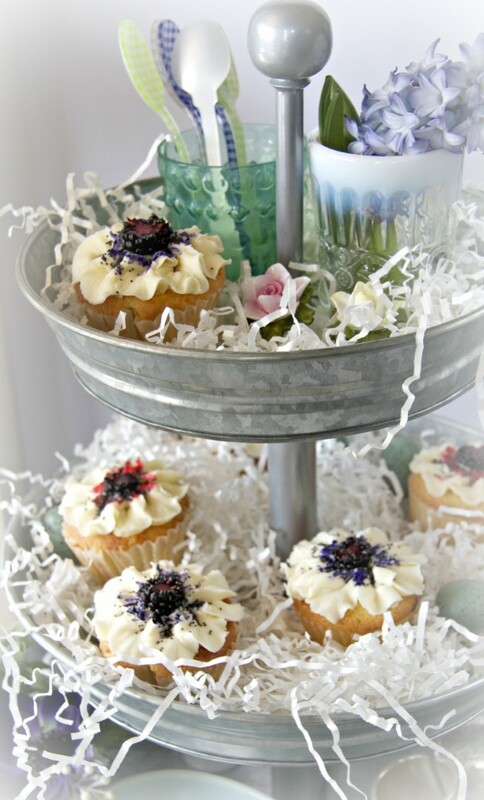 Cupcakes & Crinoline served us up some of her beautiful lemon blueberry cake, Dear Lillie showed off her fabulous spring dining room, My Uncommon Slice of Suburbia shared a darling painted scrapwood sign and Simply Klassic Home taught us how to create an easy spring centerpiece! 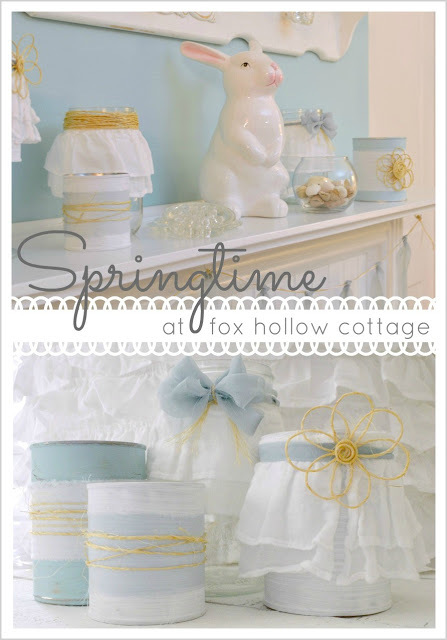 Be sure to hop over to visit Shannon from Fox Hollow Cottage tomorrow for the next stop on our fabulous It’s a Spring Party! We’re also excited to be joining these other amazing bloggers later in the hop! Debbie from Debbiedoo’s, Heather from Setting for Four, Angelina from JoJo & Eloise, Vanessa from At the Picket Fence, Maryann from Domestically Speaking, KariAnne from Thistlewood Farms, Courtney from French Country Cottage, and Jennifer from Jennifer Rizzo. Be sure to follow along and on March 18 we’ll all be hosting one HUGE It’s a Spring Thing! 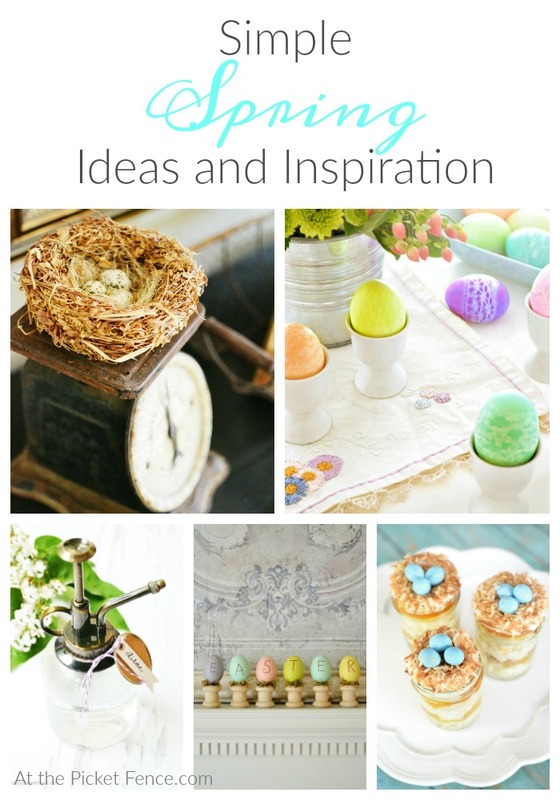 Linky Party where you can link up your spring and Easter posts. Hope you’ll join us!